In 4-quart Dutch oven or stockpot, combine chicken, water, onions, celery, celery leaves, bay leaf, salt, pepper and poultry seasoning. Bring to a boil. Cover; simmer 45 minutes or until chicken is fork-tender, no longer pink and juices run clear. Add carrots; cook 15 minutes. Remove chicken from Dutch oven. Cut meat from bones. 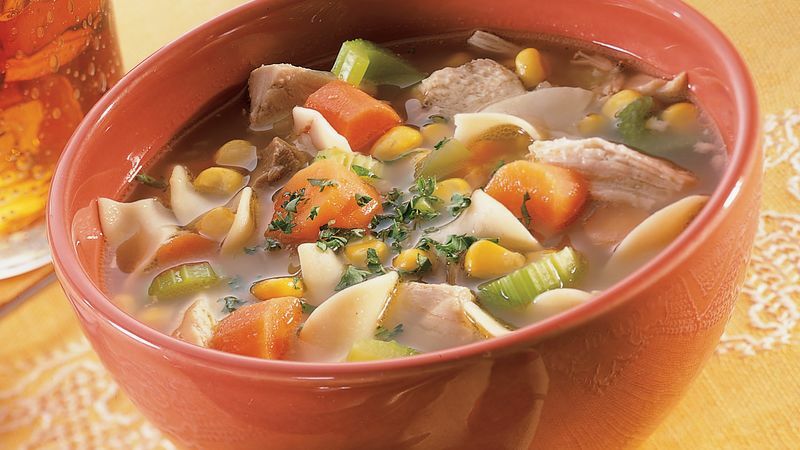 Skim off and discard fat from soup. Return meat to soup. Bring to a boil. Reduce heat to low; simmer, uncovered, 10 to 15 minutes or until carrots are almost tender. Add noodles and corn; return to a boil. Cook over medium heat for 10 to 15 minutes or until noodles are tender. Remove celery leaves and bay leaf. If desired, garnish with chopped parsley.